The ED-M 400Hz isolated input 2U rackmount models have a rugged military grade construction and accept power from dirty utility, generator or aircraft sources. Designed to solve common mode noise and phase-imbalance problems encountered when connecting single-phase equipment to three-phase sources. These ED military products convert military 400Hz three-phase input to a 50, 60 or 400Hz single phase output with a pure sinewave output, having a +/-3% voltage regulation. They weigh under 50 lbs. and offer optional UPS battery backup. RS-232 ports for remote monitoring are standard and SNMP/HTTP agent is optional. The ED-M Series three-phase input, 4U height rackmount models have a rugged military grade design and construction. Designed for use in aircraft, ground-based mobile (including HMMWV) and shelter applications. Solves generator-related phase load imbalance harmonic problems by converting three-phase power to tightly regulated single-phase computer-grade power. The ED-M Series is MCOTS available and meets rugged shock and vibration requirements. RS-232 ports for remote monitoring are standard and SNMP/HTTP agent is optional. They weigh only 85 lbs. and offer optional UPS battery backup. The ED-M split-phase input, 4U height rackmount models have a rugged military grade construction. Provides clean 208/120 or 240/120Vac split -phase power from dirty utility, generator or aircraft sources. Also, provides up to 5kVA of single-phase 115Vac, 400Hz avionics or ground-based equipment power while operating from a domestic 208/120Vac split-phase 60Hz source. The ED-M Series is MCOTS available and meets rugged shock and vibration requirements. RS-232 ports for remote monitoring are standard and SNMP/HTTP agent is optional. They weigh only 85 pounds and can be configured with optional UPS backup capability. Ultra-high performance on-line Frequency Converters for industrial and military COTS applications. Designed to protect sensitive equipment used in harsh power environments. Supports high inrush loads and high temperature environments. “A” Models are available offering operation as a Frequency Converter and precision AC voltage regulator. 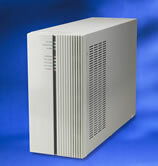 “LC” Models are available offering operation as a Voltage/Frequency Converter and precision AC voltage regulator. The 3-5kVA “A” models are some of the smallest and most lightweight units of their kind.